The play opens at the funeral of Henry V. Young Henry VI is elevated to the King of England and Gloucester accuses the Church of trying to control young Henry. A messenger arrives with word of rebellion in France led by Charles VII, the Dauphin of France, who has been crowned King. More messengers arrive with further bad news including that Talbot has been captured. The English nobles vow to fight to regain France for the new King. The scene shifts to Orleans in France where Charles loses a battle to Salisbury. Charles then meets Joan of Arc (Joan La Pucelle) who is seemingly sent from God. After they engage in physical combat and Joan wins, Charles is extremely impressed and desires to marry her. Joan explains her calling forbids her from love at present so Charles agrees to allow her to help them fight. Back in London at the tower of London Gloucester fights with Winchester over his not being allowed to see Henry VI. Returning to Orleans, Talbot has been freed by payment of a ransom and greets Salisbury. As they survey the French forces Salisbury is hit by a cannonball and mortally wounded. Talbot vows revenge. Talbot engages in battle with Joan of Arc and loses but is not killed. Joan then proceeds to capture Orleans and Charles is so overjoyed that he marries her and proclaims her a Saint. Again at Orleans the English make a surprise attack at night and force Charles and Joan to flee. The English re-capture Orleans and Talbot goes to visit the Countess of Auvergne who tries to imprison him. Talbot calls to his men to come and rescue him and the Countess is so impressed she gives them all a feast. Back in London a dangerous rift starts between Somerset and Richard Plantagenet after Somerset degrades Plantagenet about his father having been executed by Henry V for treason. This sows the seeds for the future War of the Roses. At the tower of London Plantagenet visits his uncle Edmund Mortimer who explains his imprisonment by Henry IV because of his threat to his title. Plantagenet becomes convinced that the Throne of England should have gone to his father. At parliament, Gloucester and Winchester resolve their dispute and Richard Plantagenet is named the Third Duke of York by young King Henry VI. 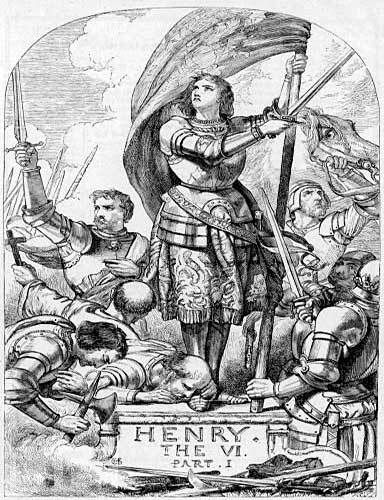 Henry VI then departs for france to be crowned King of France leaving his great Uncle Exeter to repeat the prophesy that Henry V would win all and Henry VI would lose all. In France, Joan of Arc continues to fight the English with Charles and drives them from Rouen. The English under Talbot counterattack and retake Rouen. Talbot marches to Paris for the coronation of Henry VI but Joan convinces the Duke of Burgundy to switch sides and fight with the French. In Paris, Talbot meets with Henry VI who rewards him by naming him the Earl of Shrewsbury. In Paris at the palace, Talbot learns of Burgundy's revolt and prepares to meet him as an enemy. King Henry VI tries to make peace between Somerset and Richard Plantagenet and sends them to reinforce Talbot in battle. They continue their quarrel which results in Talbot not receiving needed support. At Bordeaux Talbot's son joins him and they both perish in battle due to not receiving reinforcements. Returning to London, Henry VI is pressured to make peace with France and marry Margaret, the daughter of the Earl of Armagnac. In France Richard Plantagenet, the Duke of York, fights with Joan of Arc at Angiers and captures her. At the same time the Earl of Suffolk captures Margaret of Anjou and begins to scheme for her to marry Henry VI while planning to seduce her himself. Joan of Arc, condemned to burn, denies her own father and claims she is pregnant though still a virgin. The Duke of York does not believe her and has her burned to death. York is informed of the peace settlement and is not happy about making peace with France. In London, King Henry VI agrees to marry Margaret of Anjou falling into the Earl of Suffolk's trap to control him through Margaret. Lords, Warders of the Tower, Heralds, Officers, Soldiers, Messengers, English and French Attendants. SCENE: Partly in England and partly in France.